Just a little Christmas time casual for your Thursday morning! Thanks for stopping by! Beautiful casual look. Love the cute scarf and the booties! Looks so good, perfect for these days! Lovely outfit! You’re such a stylish mommy to be! Love the scarf! Very Christmas-y! Love your bump!! Cute look! Beautiful scarf, perfect holiday accessory! I love this casual holiday look!! You have incredible style! Love this look! So cute! Those boots are amazing!!! You look gorgeous in this casual attire. That’s pretty much my uniform. You look great! Love this look. That scarf is SO perfect for this time of year! And your bump is too cute! This is such a cute post!! Love it! Perfect casual cosy look! Your scarf makes me want to swaddle in a big checked blanket coat and read a book by a fireplace! Plaid and chambray are a match made in comfortable clothes heaven! I love the hat and boots! 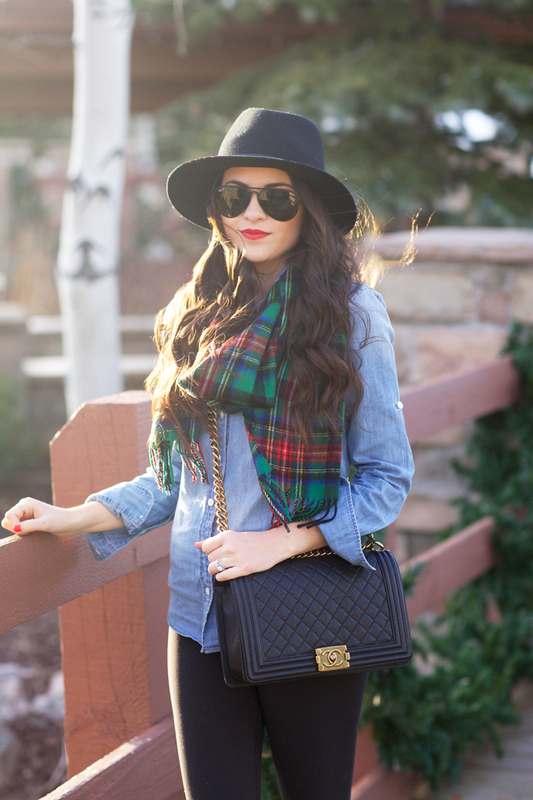 This is such a cute look, love your plaid scarf! Glammed up casual! I love this look. It shows how easy it is to fancy up any outfit with red nails, lips, and a great handbag. This is an especially useful idea for the casual capital of the world, San Francisco!! Haha. Beautiful! In love with all your casual outfits! They are all so timeless and chic! Love this look! It’s perfect for the Holiday! It’s causal yet chic! Love this cozy casual look. Especially the hat and scarf! And the baby bump!! I love this outfit! That scarf is so cute and festive! adore this pretty outfit! gorgeous boots! The perfect look for picking up a fresh Christmas tree! Love that cozy plaid scarf and of course, your Stuart Weitzman boots! I love the simplicity of this outfit but that it’s also very festive with the plaid scarf and red lips. Very cute! Love, love the pop of color with the scarf! Perfect. This outfit is simple, but stands out thanks to your fantastic accessories! Such a perfect casual winter outfit! And your baby bump is precious! Love this casual look, and that scarf is perfection for the holidays! Classic fall look! Loving this hat! your bump is so adorable! love this casual laid back look. Love this casual look! I love wearing outfits like this for a day of running errands around town! Love the top! Just featured a chambray shirt on my latest post as well! Very chic. I love everything about this look! It is perfect for the not really that cold Northern California weather. I cannot believe how well you concealed your bump for so long because it is so stinking cute! I love that scarf! It’s perfect for the holiday season. I absolutely love your bump, it makes me miss being pregnant :) Your outfit is super cute! Oh my gosh – Congratulations!!!! Somehow I missed it – so happy for you!! I love your style. I love the scarf and bag. I love those boots! Might you be able to share the actual top shaft circumference and the circumference around the widest part (if not also the top)? Lovely photos! I need those boots! Loving the chambray and leggings combo! Great look! I notice you are not wearing maternity leggings yet. Have you purchased maternity leggings (or tights) yet? If so, would love to know what brands you are liking. how did you hide your belly for so long!!! Love the scarf! You’re rocking the bump really well! This outfit is so cute and something I wear all the time in my own life. The plaid scarf is so cute. Have you ever done a post on red lipstick application? I can never get mine to be quite as awesome as I want and yours always looks amazing! Causal looks are the best! Those boots are gorgeous, they look so comfy too!! Man, you pregnant chicks get to wear leggings all the time and it’s socially acceptable. If it weren’t for the resulting baby, I would totally get pregnant for the comfy clothes. This is the PERFECT Christmas a Casual look! I love every single piece of this outfit. Chambray and leggings are my go-to foundation. The scarf is so beautiful and festive. Your red lips are always gorgeous!! You took amazing basics and put together one fabulous casual chic look that is perfect for so many casual holiday occasions!! Love the addition of a classic black bag to the casual chic outfit, it makes the whole look more sophisticated instantly! Cute hat and beautiful boots too! Love this casual christmas style. The scarf is beautiful. I love it in the green color. I saw always red plaid pattern scarf but these one is different and so xmas. Lovely casual outfit. It looks super comfy, yet still put together! Loving those over the knee boots. Oh and that hat is gorgeous. love this casual look! That hat is fab! So cute, I LOVE your boots, Gorgeous as usual.